We’ve all heard this argument many times. You know where I stand! After a long wait the Taurus PT 1911 in stainless steel has finally started to arrive in gun shops. I’ve been waiting on this 1911 for many a month and my local gun store got one in a couple of days ago. Yea, I grabbed it even though I thought they had the price to high at $669!. Since I got it by doing some trading it worked out fine. 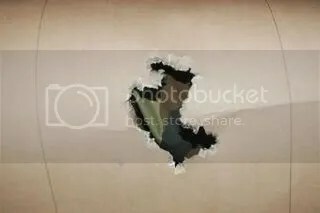 It was to late in the day to go shooting so I took my new prize home took it apart down to the last part and examined the entire gun. I found it well made with no tool marks or other anomalies. I have always heard the advertisement from Taurus about it essentially being a custom made factory gun. This sounds like an oxymoron to me since a custom gun to my way of thinking is one made by hand by such renowned makers as Bill Wilson and Ed Brown. I’m willing to give them the benefit of the doubt so here we go. Taurus states that each part is hand fitted and while the gun will accept stock parts from after market suppliers you will have to do additional fitting since they spend so much time fitting in house components. There are a number of MIM parts in this gun without a doubt. Taurus makes them all. 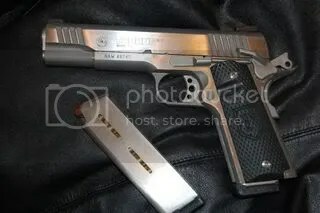 In fact the CEO of Taurus stated at the SHOT show that ALL parts are made on site by Taurus to their specs. This pistol is well made with a very nice finish.The sides of the frame and slide are nicely polished with the top of the slide a matte gray to prevent glare. The ambi safety moved off and on with a positive click. 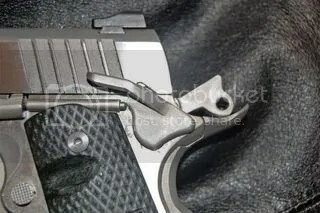 The trigger Taurus uses is a proprietary part that needs no adjustment even though it does have an adjustment screw. 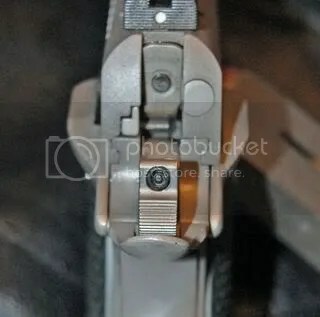 The trigger pull is smooth with no stacking and is consistent throughout the trigger pull. I measured the pull at just a shade under 4 pounds using the trigger pull gauge at the gun shop. I honestly wondered if the trigger spring was moving fast enough to fire the primer. I was proved wrong at the range. The MSH is cut at 30 LPI and provides a good purchase for your hand. Couple that with the factory front grip strap also cut at 30 LPI and the gun doesn’t move at all when fired. Taurus also places a 30 LPI checkering on the bottom of the trigger guard. I’m not sure of the purpose behind that but it doesn’t hurt anything. All of the checkering is well done and evenly cut. 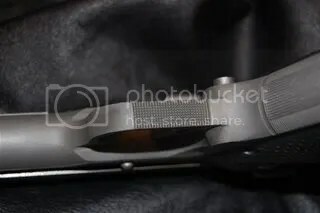 The magazine release is slightly longer than normal but is well done and does not release the mag when holstering the gun. The magazine well is also beveled nicely. The hammer is of the commander shape with a safety locking system at the top. I’ll never use it but I think I’ll keep the two keys that come with it. This lock is not as obvious as some others so I see no need to change the hammer. If you did change the hammer you have to also change the hammer strut since it’s not a stock shape and is a part of the key safety system. In the above picture you can also see the slide to frame fit which is very snug viewed from the rear! The beavertail is well fitted with even spaces on each side. The barrel bushing is also air gaged for a proper fit. The pistol has a FLGR which I’ve never been wild about but is really neither a positive or negative feature. I did have a small reservation before I fired the gun because the slide to frame fit was so tight. I was correct to be concerned. My concern melted away after the first 50 rounds fired. 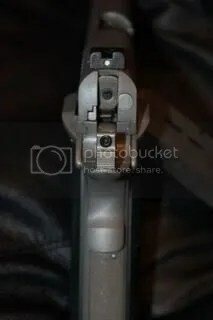 During the first 50 rounds the fit was so snug I had several failures to return to battery and chamber a round. After the first box of ball ammo was fired the slide smoothed up greatly and I experienced no further problems. The slide is still snug but very smooth now. 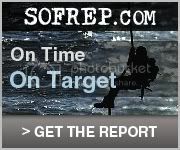 This target is three seven round magazines fired from 10 yards in fairly rapid fire. The group measures 1 1/4 inches side to side and 1 7/8 vertically. Not to shabby performance from a new gun. This target was fired using Blazer brass 230 grain ball. This is the first gun I’ve owned with these sights and I must say I’m very satisfied with them. In fact even at this early stage I prefer them over any other sights I’ve used because of the ease of use and the speed which you can align them. Even with 56 year old eyes they work very well. I fired a total of 250 rounds of various types of ammo after the first 50 rounds of ball ammo. I used Federal Hydra Shoks, Hornady 200 grn +P’s, Hornady 230 grn +P’s, some old Winchester Black Talons and 150 rounds of the Blazer ball ammo and Winchester white box ball ammo. Again, I experienced no malfunctions after firing that first 50 rounds of ball ammo. I mixed magazines using the factory mags which are very close to the ACT mags, Wilson 47D’s, Metalforms as well as some old Colt magazines. The Taurus didn’t have a problem feeding from any of them. I didn’t have access to a chronograph this time but I believe you can determine from my shooting results that this Taurus is a fine addition to the 1911 family. 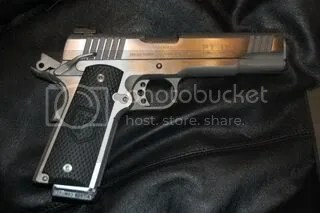 A very well put together accurate pistol that in my opinion you can trust for daily carry after you run some rounds through it to break it in as you would with most 1911’s.